If we ever have leftover Meatballs which is usually not the case in our house, this is a great way to make another fantastic meal with those leftovers! We have made submarine sandwiches as well with leftovers meatballs but who doesn't like pizza? Honestly I have to make a batch just for these reasons. Covered sandwiches and pizza. Starting with homemade long simmered meatballs, then making the fresh dough, cheese and meatball topping this becomes a whole meal in itself! A small antipasto on the side and vino you're good to go! We never let leftovers go to waste in our home, there is always another plan to recreate another way to use whatever we have into another meal! Starting out you will need meatballs cooked and in sauce. The next part of this recipe is a great dough recipe store bought around 1 lb. Stretch out the dough on a deep dish greased pizza pan ( I use Crisco). Let rise until doubled. Bake on 400 degrees until browned around 25 minutes. Remove from oven. Sprinkle with olive oil on both side. 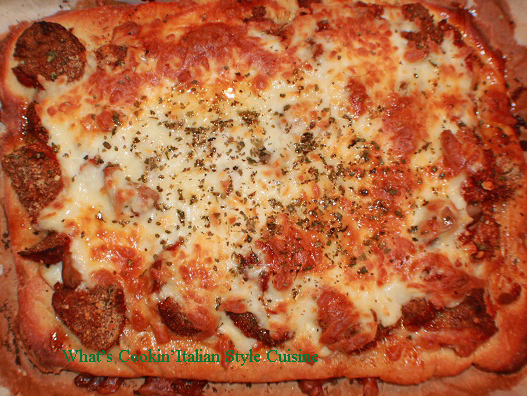 Top with sliced meatballs and lots of grated parmesan cheese, sliced garlic and any other toppings. Add a generous amount of whole milk mozzarella cheese and bake again on 400 degrees until cheese is browned and bubbling. Sprinkle with dried oregano if using or fresh basil. I sprinkle more grating cheese on mine and pour some hot sauce on top. My pizza slice looks like a covered open face sandwich! Cheers!